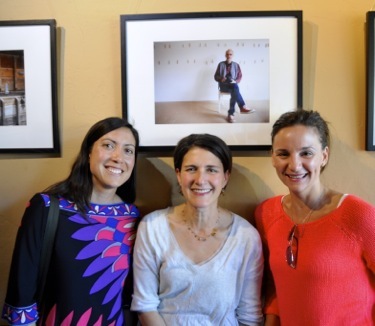 It was “all hands on deck” as InMenlo’s very talented photographers gathered at Café Zoë in Menlo Park this evening to salute photographer Scott Kline, whose photographs are on exhibit through the end of May. In addition to solo portraits, Scott did a collage (of sorts) of the hundred or so photos he’s taken for InMenlo (behind Scott in photo, top) starting in 2011, the result of an InMenlo interview that focused on his midlife change in careers. Attendees included other InMenlo photographers (left to right) Frances Freyberg, Irene Searles and Laura Hamilton, photographed in front of Scott’s portrait of photographer Neal Mensch. Did we say it was an “all photo” evening?